Asbestos is the name used for a group of natural minerals that are made up of many small fibres. These fibres are very strong and are highly resistant to heat, fire, chemicals, and wear due to friction. spouting for drainage and water supplies. Asbestos was mainly imported and used before the 1980s. Once the health risks of asbestos were known, its use was gradually stopped, and other materials used instead. However, products and appliances with asbestos content may still be around, particularly in homes built before 1984. The colour differences are very slight and laboratory analysis is needed to identify different types of asbestos fibre. 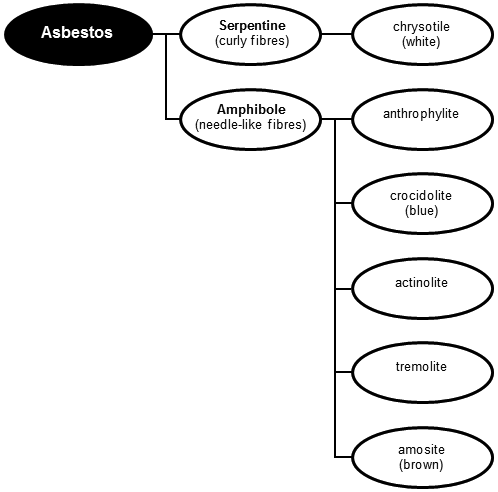 Importing these 3 types of asbestos in their raw fibrous states is prohibited. There are 6 types of asbestos, which vary in fibre size and length. The longer and finer the fibre, the greater the danger if inhaled. Crocidolite and amosite asbestos (amphibole group) have been identified as most dangerous. Their long needle-like fibres can easily penetrate through to the respiratory tract (breathing pipe) and lungs and are most likely to cause health problems. Chrysotile asbestos (serpentine group) is thicker due to the curly nature of the fibres, and unable to penetrate as far. Information from NZ Ministry of Health.